On a Sunday morning in February I caught the RER A from Maisons-Laffitte to Paris. 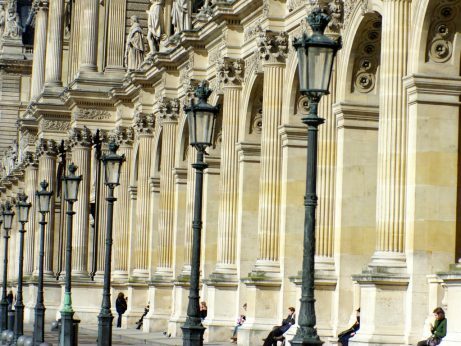 I had planned on the previous day an itinerary from the Eiffel Tower to the Louvre. The weather forecast had been quite optimistic. Although chilly in the morning, la météo was forecasting a beautiful sunny day and it was not at all wrong! Distance: approximately 6.5kms (4 miles). How many times have we seen the Eiffel Tower? Maybe a thousand times… still we’re always tempted to take tons of photos each time we see it! On Sunday morning, the Iron Lady was enhanced by the beautiful light of a February sun. 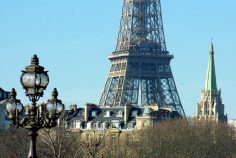 A view of the Eiffel Tower from the lane in the Champ-de-Mars known as avenue Jean Paulhan. With these fir trees, it is hard to believe we are in the centre of one of Europe’s most populous cities! The picturesque rue Saint-Dominique in the 7th arrondissement of Paris links the Champs-de-Mars to the Esplanade des Invalides and gives a great perspective onto the Eiffel Tower. The shopping street is lined with restaurants, bistrots, boulangeries-pâtisseries, grocery stores and other interesting bookshops. I used to work as a French teacher in a language school based in the neighbourhood! Rue Saint-Dominique takes you to the Esplanade des Invalides, a vast lawn that stretches between the Hôtel des Invalides to the River Seine. 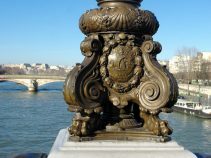 Once on the Esplanade des Invalides, we turned left towards the River Seine and the Quai d’Orsay. There we crossed one of my favourite bridges in Paris. 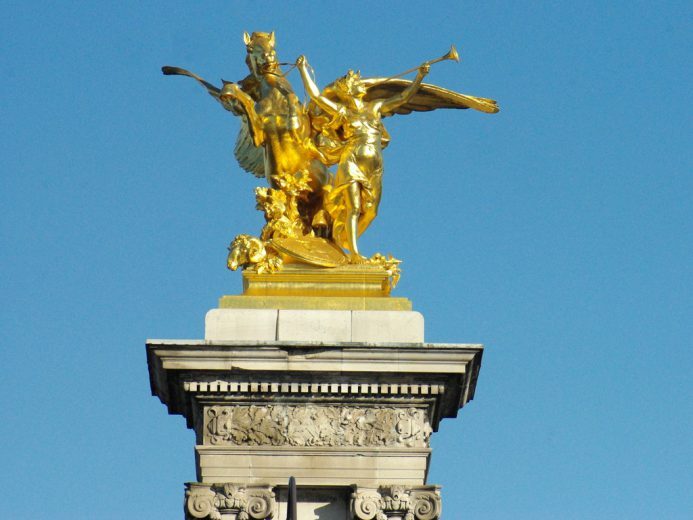 Pont Alexandre III was built for the 1900 Paris World Exhibition and takes its name from the Russian Tsar. 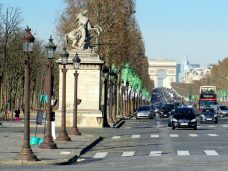 The bridge leads to avenue Winston Churchill where two grand buildings are found on each side of the street: Grand-Palais and Petit-Palais. 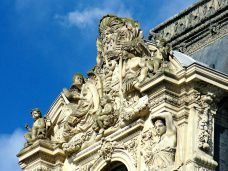 The monumental Grand-Palais seems like it has been there for many centuries… but the structure is relatively recent as it was built for the 1900 Paris World Exhibition. The frescoes, the statues, the columns… everything looks majestic. 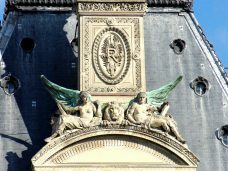 The Grand-Palais is topped by the mast bearing the French flag. 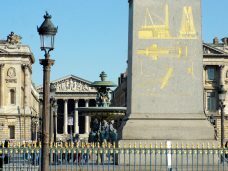 Opposite the Grand-Palais stands the Petit-Palais and its remarkable wrought-iron gate. 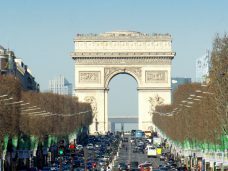 In the morning, the sunlight falls on the façade of the Arc de Triomphe at the top of the Champs-Élysées. 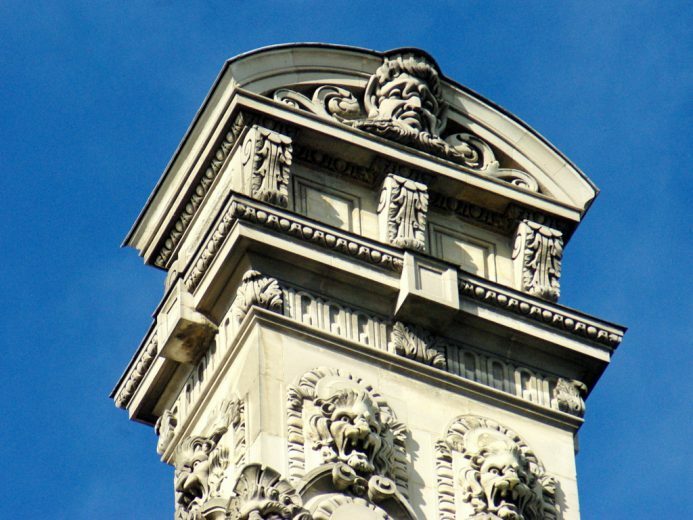 With good eyes (or with binoculars) you can spot visitors enjoying the view from the top of the triumphal arch! 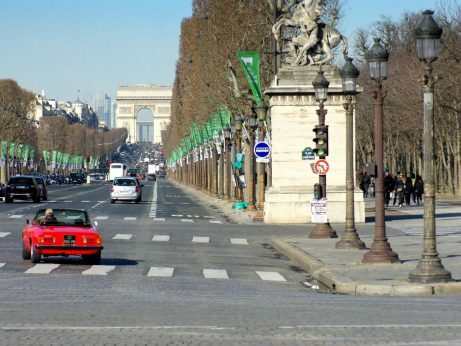 The Champs-Élysées ends at the majestic Place de la Concorde. 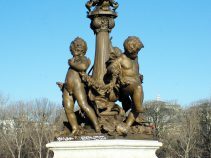 The Place de la Concorde is a treat for the eye, particularly for the one that takes the time to explore every little details: the monuments dedicated to eight cities of France, the extravagant lamp-posts, the statues of the two fountains by Jacques Ignace Hittorff and the hieroglyphics that decorate the Egyptian obelisk of Luxor. The Ferris Wheel that stands on the Historical Axis that runs between the Louvre and the Grande Arche was due to close on the 15th February but was still open and running. 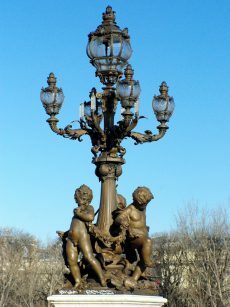 The last stage between arriving at the Louvre is the Jardin des Tuileries. We entered the garden through beautiful gilded gates. The exquisite Tuileries Garden was crowded by the time we reached the garden. 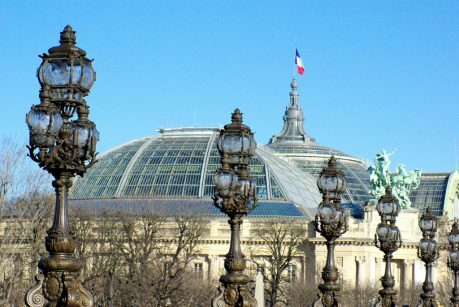 Two of our favourite places are the terrasses (Orangerie and Jeu de Paume) offering a fine view over the busy Place de la Concorde, the Champs-Élysées and the Eiffel Tower. 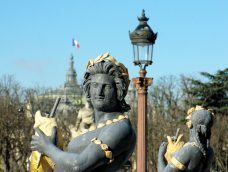 The Grande Allée of the garden that runs along the Historical Axis gives spectacular views to the Grande Roue westwards and the Louvre eastwards. At the end of the garden stands a monumental triumphal arch. 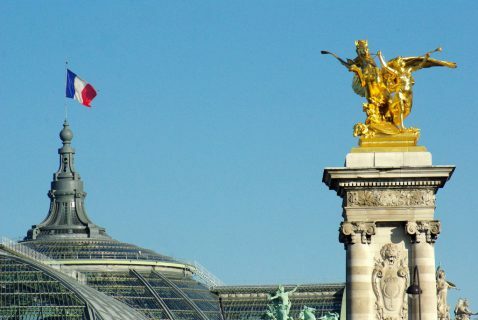 The Arc de Triomphe du Carrousel was built by Napoleon in the early 1800s to commemorate the victory of the French Imperial Army in Austerlitz. 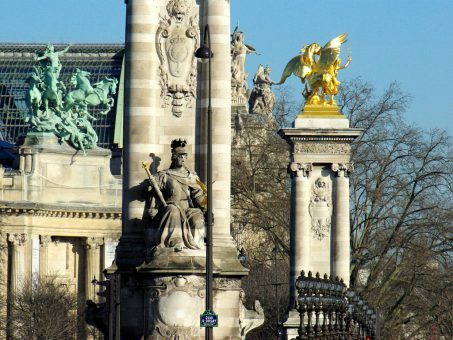 Marking the limit between the Tuileries and the Louvre, the triumphal arch was once facing the Tuileries Palace. 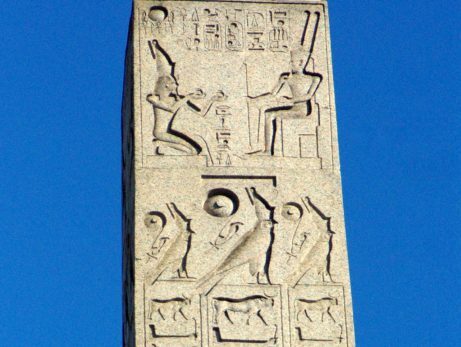 Since the dismantlement of the palace in the 1880s, the monument has been part of the Historical Axis. 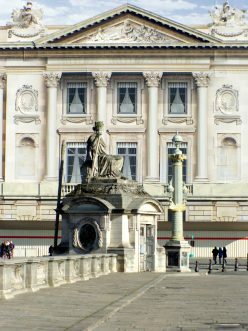 The Glass Pyramid in the centre of the Cour Napoléon is unmissable. By the time we arrived there, the museum was already opened with a long waiting line at the entrance! 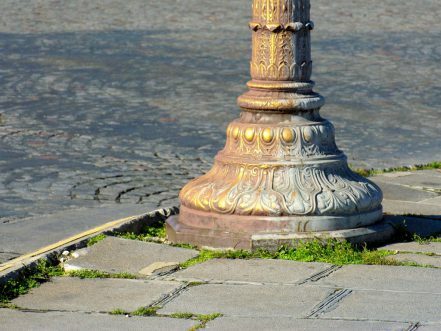 Hope you’ve found this walk from the Eiffel Tower to the Louvre interesting! If so, please do share this article on Facebook or twitter! Thank you for the armchair trip through Paris and the delightful pictures. Wishing you and your little family lots of happiness in your next home in the mountains. 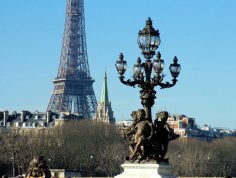 Well done, Pierre, both for the itinerary and for the excellent photography. I wonder if the authorities will really remove the ferris wheel, as announced, to improve the view along the Historical Axis? Thank you very much Melissa for taking the time to comment. I am very thrilled for you about your upcoming French journey. I really hope you’ll have an unforgettable time here in France! All the best!